The Spoked Traveller | Whisky — ohh, the burn! Whisky — ohh, the burn! 02 Dec Whisky — ohh, the burn! “I’m part Scottish and part Polish. Which means, I like to drink, but I don’t like to pay for it,” says Frank Biskupek, the Scotch Brand Ambassador for Glenlivit. This was going to be a good night. Frank and a room full of whisky lovers (and neophytes such as myself) are here at the Black Dog Village Pub and Bistro in Bayfield celebrating St. Andrews Day– Scotland’s Patron Saint celebrated on November 30th. Frank is taking us through a five-course menu paired with whisky ranging in age from 12 to 21-years-old. Oh, the burn! 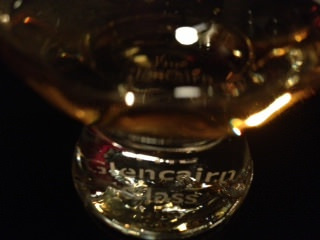 The night starts with a procession: a bagpiper followed by Dog co-owner Ted holding a tray with a bottle of Glenlivit. Quite the religious introduction. I love the simplicity of Scottish food. Maybe it’s because I’m part Scot and Newfie; our trademark dish, Jigg’s Dinner, is meat, potatoes, carrots, dumplings and cabbage boiled in the beef’s juices. 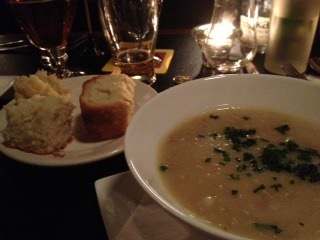 The first course of our evening, after a glass of Tennents Lager, www.tennents.com (which accounts for 1 in 2 beers served in Scotland) is Boyndie Broth. “It looks like oatmeal,” I say to my friend. Sure enough, Kathleen, Ted’s wife and co-owner, reveals that Irish Boyndie is chicken stock, carrots, steel oats and a splash of milk. “It’s stick-to-your-ribs kind of food. Good after a cold night out,” she says. We start with a 12-year-old Glenlivit. “You will taste honey, vanilla and not a lot of spice,” says Frank. This whisky was created for an American visiting Scotland in 1933 (someone important who I am sure was quite worthy of his own whisky). Regardless, the batch was so good they continued making it. 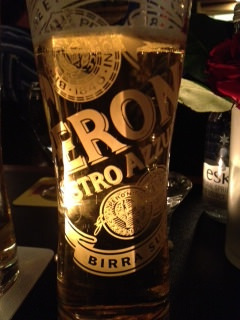 Ohh, the night wasn’t complete without an Italian beer. Light tasting Peroni takes the edge off of the whisky. I learn that Glenlivit is so particular to Scotland because not only is the barley grown in Scotland, obviously, but the water that makes the yeast is from the Highlands. It is like glacier run off that travels on fields, through rivers and over rocks. It’s a taste of the land. In wine world it’s called terroir. It’s the idea that the sun, soil and air make up the particular taste of the drink. This tastes like Scotland: earthy with a slap of cold rain. The meal proceeds for another few hours; suffice to say, they leave the best for last: “these are the whisky’s we hang our hat on,” says Frank. Aged for 21-years, the whisky has a cinnamon and almost marzipan finish. Mmmm. It runs $154 a bottle. Oh, and it still burns like a bugger. “You don’t need fleecy jammies if you drink this: you can sleep naked,” says Frank. Duly noted. 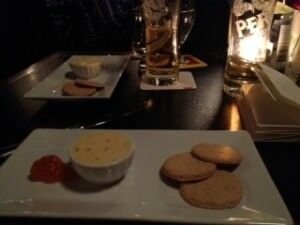 The final taste is potted cheddar with oatcakes and apricot jam with a light tasting Glenlivit Nadurra Triumph (Nadurra means natural and light in colour). My pictures are taken without a flash on purpose: the room had a yellow glow about it. And, by the end of the night, so did I.